I finally did it, I made a pie :). Well, I cheated though. I was over at grandmas the other day and after a tour of the tomato garden, raspberries and talk of slugs eating the soska (sorrel) we started talking pie. 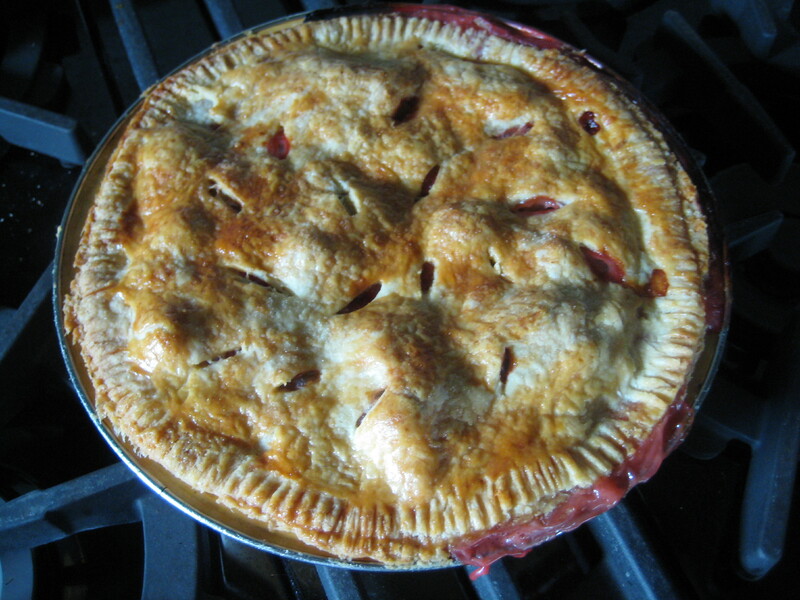 She makes pie all year round by making and freezing pie shells, tops included. She’s made round pie top holders out of cardboard and covered with tin foil, smart lady. In the summer she just adds fresh fruit and in the winter adds frozen. She is a bit sugar savvy and doesn’t like to use a lot of sugar although in recent years she started using Splenda…whadda gonna do? Oh well. However, I notice she will always give you the full recipe (sugar and all) so you can adjust it yourself. She knows you need to know and understand the basics before experimenting, so she never filters a recipe before giving it to you. 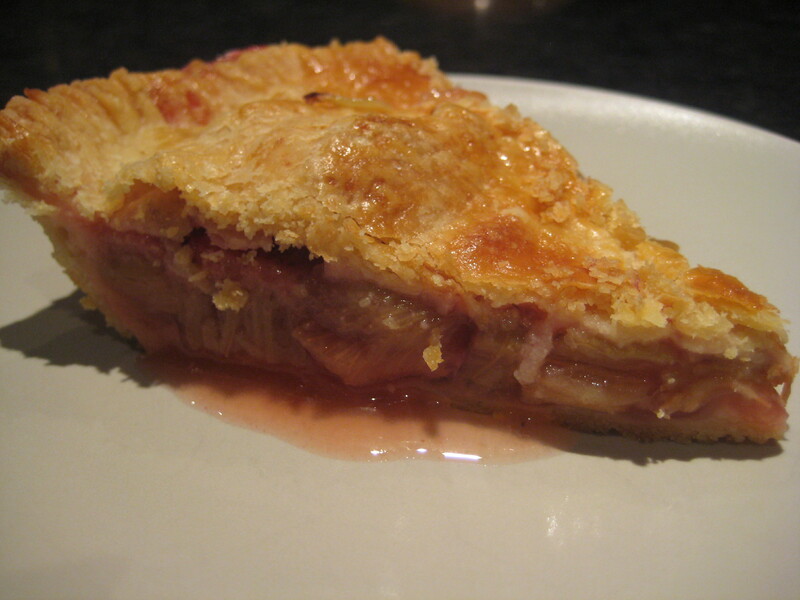 I have said before I am not a pastry chef, but she felt that I should make a pie with all the wonderful rhubarb I have. She is not happy with her own and can be caught now and then snatching some from my garden…and doing a general inspection of my gardening skills in which she gives me a report the next time I see her (rave reviews the last time :)). So, to facilitate this pie making she sent me home with a frozen shell and top. A boost of confidence, she trusted me with a pie crust! 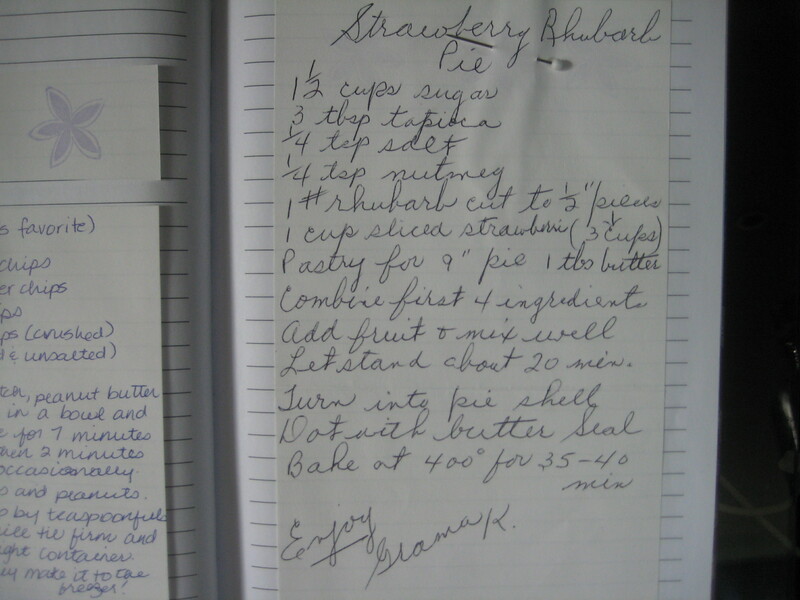 In a previous post, I told you about the recipe journal I got at my wedding shower, with recipes from all the ladies pasted inside. Well grandma shared Strawberry Rhubarb Pie of course. I love how my friend kept the pin in the paper. So with recipe in hand (and a few other pointers that were left out) I gave it a go on Sunday. Mix the fruit with the tapioca, sugar/honey, nutmeg and salt. Let sit for 20 min. 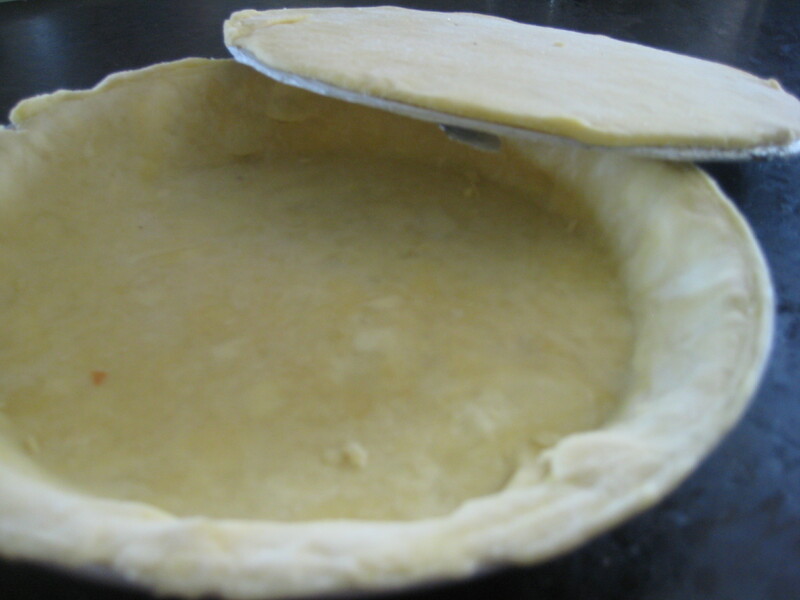 Dust the bottom of the pie crust with the cornstarch. 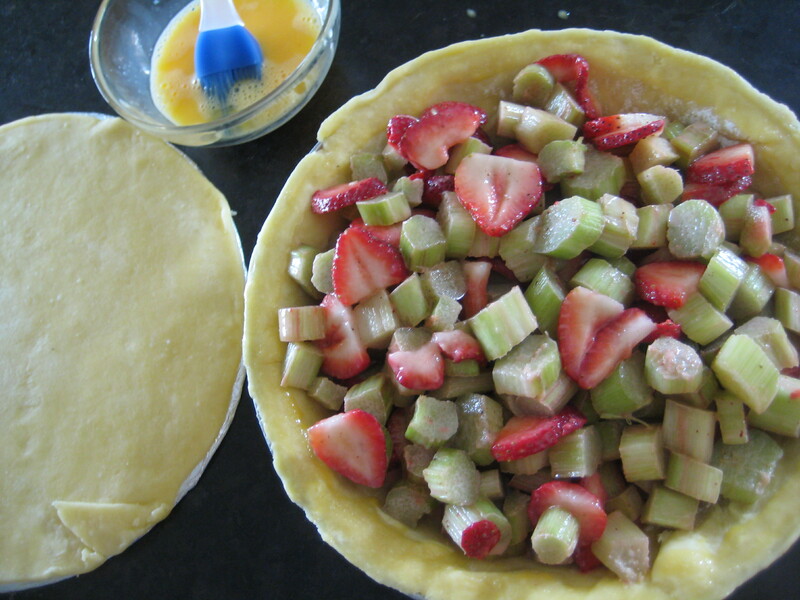 Add the fruit to the pie shell. 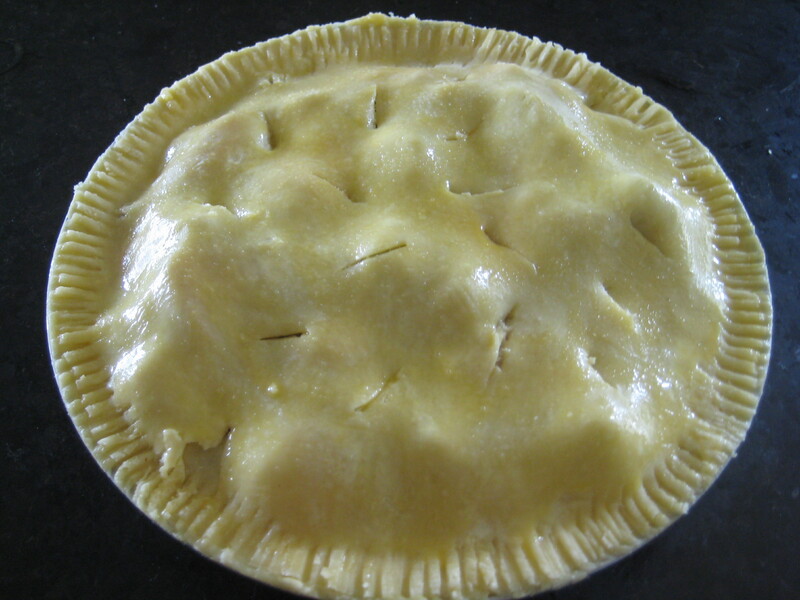 Brush the edge of the pie shell with an egg wash or water, put the top on, press the edges together lightly with a fork and trim excess (some people do fancy edges, grandmas way is faster and easier). Cut 8-10 openings in the top and brush with egg wash or water. Bake at 375 F for 1 hour or until golden brown on top. Use pieces of tin foil to catch any dripping fruit. Don’t put a pan or big piece of tin foil under the pie or you disrupt the heat. Well, it turned out pretty good. I learned I need more tapioca with the honey and I could have used a bit more honey. I have green rhubarb so it is a bit more tart. T liked it and that’s all that mattered, ah. Now, to learn to make my own crusts…. What is your favorite fruit pie?